No. You’re not. Not always. Sure, you’re entitled to your opinion on what is the best ice cream flavor. You’re even entitled to your opinion on which is the best holiday (it’s Thanksgiving…more on that later). Joey, what gives you the right to write this? I’m glad you asked. Because I’m an expert in this area. The internet has provided access to millions of people. But just because you have access does not mean you have expertise. What I see happening online is disturbing. There are people posting so often that their voices are heard more, and they are therefore treated as experts. But a lot of these people have no standing in the real world. Recently, I read as the Associate Principal Trumpet of the Los Angeles Philharmonic and the Third Trumpet of the New York Metropolitan Orchestra were, separately, berated online for offering their opinions on some trumpet related matters. I’d like to say that I was amazed, but considering what I’ve read in the past few years online, I was just sad. I’m so glad you asked. You are full of good questions today. We need to make the online community more representative of the real world. Here’s what I mean by that. Let’s say you have a trumpet related question. -In the real world, if you’re in school, you would probably ask your teacher and some of your classmates. If you’re not in school, you might ask your colleagues and other people you trust. When given responses, you would likely thank them, even if you didn’t fully agree with what they said, as I know you to be nothing if not polite and gracious. It’s also likely that you would give more weight to the answers from your teachers and colleagues for whom you have respect. -Online, you might post your question on a message board or forum. When a professional offers a response, it might be a good idea to thank them and try out their advice. When another person replies telling the professionals that they have no idea what they’re talking about, I’d like to see the online community ignore them. I am in no way saying that all professionals agree on all matters, or that you can’t get good information from other sources. Listen to the experts who take the time to offer advice. Ignore the people that seem focused on tearing down, rather than building up. Post as if you’re speaking to a roomful of strangers. I know we can do better. Let’s start now. Thanks for this commentary, Mr. Tartell. And, I, for one, thought his rendition was beautiful. He is the ULTIMATE professional! I have had different versions of this conversation with top trumpet professionals in the classical and jazz worlds as well as university educators. You have articulated a pervasive problem in our society. ANYONE can hide behind the anonimity of the internet and snipe at others who put their tallents on the line for all to see. I travel in the highest circles of both the trumpet world and wildlife photography. Believe me, the problem is just as bad there. Please keep your message of staying positive in all things. You are a voice people listen to and respect. Thanks for the post! PS do you remember playing through Europe with Jazz Abroad? Of course I remember Jazz Abroad. That was such a great few weeks. We had a great time. I still have our LP in my office. I agree with all of this, although I would add that everything here applies mostly to the technical aspects of brass playing, pedagogy, equipment, etc. However, when it comes to *artistic* opinions, I actually think that musicians are often too locked into impressing their peers and seeking acceptance and validation from them. My sense is that there are a number of different models for becoming recognized in music. To name three of them: 1) become a technical wizard ala Allen Vizutti, 2) become known as somebody that improvises, composes, or performs mind blowing content, 3) make non-musicians feel good when they hear your music. In my opinion, the world is pretty saturated with #1 and #2, and that if you are interested in #3, the opinion of Joe Sixpack is exactly the kind of opinion that matters. Some would call this route “selling out”, but to be clear, I’m not talking about engineering music you don’t really like yourself for Joe Sixpack, but simply calibrating various balances between your artistic interests and the interests of your audiences (given a large enough of a sample size). For this, like I said, this idea of “expertise” doesn’t really work the same way, IMO. I think too that maybe what Joey is touching upon here is the idea that everybody feels like they can be an expert on technical matters because they have an opinion on artistic matters? Some really solid points here Joey! It’s hard to rise above the rampant negativity and cloak of anonymity these social media forums provide. Next week you’ll find out exactly why Thanksgiving is the best holiday! Thank you! You may be interested in a piece I wrote for Oxford’s blog that was published on 11/4 expressing similar thoughts. I hope we are creating a trend. I read your piece. It’s excellent. I too hope we’re creating a trend. As you might imagine, things are very similar in the trumpet world. well I would say everyone is allowed to have an opinion and going to have one anyway BUT it does not need to be verbalised does it- one can be tactful, supportive, and positive. Great post. Too many people don’t know the difference between objective and subjective factors, and when it comes to music it can be particularly offensive. A better and more succinct way to say this is simply that you are entitled to your own opinion (even if it is wrong and stupid) but you are not entitled to your own facts. The value of an opinion is subjective and tied to the expertise behind the opinion. Facts are not so constrained by subjectivity. They are true or false. It is perfectly possible to disrespect bad ideas held by foolish people without actually disrespecting those foolish people. It is not possible to disrespect objective facts and live in reality. Honestly, I don’t know if its even possible to make factual judgements about subjective things. If I were to attempt to do so I would gingerly argue from facts I could derive from the subjective. Claiming to be an expert (even if you really are, and you are) is quite different than letting other people say you are and expert. Somehow it doesn’t carry as much weight. Botti’s SSB was beautiful, moving, and original all at once. It commends study on multiple levels including technique, musicality, and creativity. It’s a wonderful example of understated elegance and can be listened to multiple times. The are a great many specific facts about that performance that can be analyzed. However, all of this is just my opinion. Most trumpet players only wish that their trumpet sound was as good Botti’s. Botti is wonderful. His superb vintage Martin trumpet tone is among the finest of all times. Before I state MY opinion about your post, I would like to hear more from you regarding your favorite holiday. Mine is Thanksgiving as well. Anyway, I must say that while I DO understand your point about being an expert and therefore stating that an expert opinion is valid, I think it’s also valid/okay for a non-expert to state his/her opinion about something. An opinion is what is felt in the “eye of the beholder,” so to speak. A fact is a statement that can be shown to be either true or false. I think it’s okay for people to share their opinions, yet I don’t think it’s nice for folks to state their opinions in a rude or disrespectful tone. Joey, I am just thrilled to have someone actually tell the world the truth: just because you have an opinion does NOT mean you know what you’re talking about! The anonymity of the Internet allows anyone to “talk” without fear of ridicule or repercussions, unfortunately. And it doesn’t just apply to the music world, either, unfortunately. Beautifully played! Better than many vocal interpretations. It’s so easy to tear people down, especially online. Another thought: When there are so many opinions posted online, I will always be able to find something that backs up my own opinion… even if it isn’t correct/helpful. As a consumer of information, other people’s opinions online can fuel my own small-minded ‘research’ into any given topic. So, even if I’m not involved in the original discussion, finding someone who is ‘loud’ online, with my own opinion, can increase my sense of superiority and have a flow-on effect on my knowledge, skills, lifestyle, etc. Summary: opinions are dangerous beyond the discussion. The audience is bigger. I love his rendition, I think most people where no happy that it was not the traditional National Anthem played, I guess that will be another discussion for another day. The trumpet community can be pretty dysfunctional at times. We all have certain preferences but artists like Chris Botti bring a great deal positive attention to our instrument to the listening public. That can only be good for all of us. It’s all about being respectful and having consideration for others’ opinions. There are people who get off by poking the hornet’s net. They are sad little people begging for attention. I do not play trumpet, but I have perfect pitch and impeccable ears; if you don’t think the last note Botti played merits instant calumny – you’re deaf, jack and you don’t know jack, either. Emperor has no clothes, dum dum. Wow, now I get it. You have never played trumpet but have perfect pitch. So….without understanding what it takes to play the instrument you can now imply by your eloquent response that Chris Bodi’s performance is sub par and by extrapolation is a poor trumpet player. AND…anyone who liked the performance must be deaf…and dum…I’m sure there was no pun intended. You have just defined the argument. People are confused with the definition of expert. An expert is recognized in their particular field for a skill or technique. They possess extensive knowledge based on their OWN research and experience in their field of study. Experts are ASKED for their advice. Although, as you said, one expert doesn’t always agree with the next. An expert has attained proper training, has exemplary credentials, a good education, a level of professionalism that is always withheld, and appropriate experience. This is knowledge beyond that of the average person’s. Experts have prolonged experience in their practices. One may have acquired the knowledge, but without the experience, one cannot be an expert. I watched the video, and found his playing to be beautiful, his technique professional, etc etc. (I am a non-professional brass player and am awed by people who can play like that, and in such public situations.) I wish I could play like that. BUT — if you want to be objective, as you claim — he played the melody wrong. I.e., not as written. 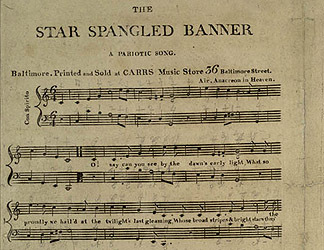 The melody on “banner” does not go up on the first syllable — look at measure 32 at http://www.virtualsheetmusic.com/score/USAAnthem.html?tab=pdf&pdfloc=11379650/USAAnthem&multiflag=&fromsel=&allsmcall=&tk=&rt=&frds=. So professional though it may have been, it was incorrect. Everybody thinks they know the melody and never bother to refer to the sheet music. Sorry, but either you play it “right” or “wrong”. “Sorry, but either you play it “right” or “wrong” this perhaps may be why you are in awe of higher level players and are indeed not playing at a professional level. Limiting musical performances to black or white right/wrong is quite ignorant. If you do not understand how music is more than right or wrong, you shouldn’t be commenting online to provide your 2 cents on a topic which you do not fully understand. ….which is exactly what this article is about. Don’t you mean that “when a professional offers a response, it might be a good idea to thank him or her and try out that advice”? Just had to tease you about that because it is so unusual to find any errors of grammar or syntax in your writing. And, of course, your spelling and logic are unassailable. Joey, you nailed it again! This is exactly why I stay away from the “trumpet forums”. The interaction disturbs me tremendously. People show off both their arrogance and ignorance on a social level, and I wonder how they have any advocates at all in life. Just be respectful…that’s a pretty simple rule that is usually appropriate in every aspect of human interaction. Joey, I have NEVER cared what other trumpet players said. I try to hang with rhythm section players as much as possible. They have the perspective I dig …. music ….. Very good advice Joey. Thank you! Lovely blog entry, and very true. I see too much negativism everywhere on the Internet. By the way, I have made it a personal rule never to criticize another musician. The old saying, “people who live in glass houses shouldn’t throw stones” certainly applies to me and my musicianship. Last time I checked, no one has asked me to play The Star Spangled Banner for a football game — or for a ping-pong game for that matter.